There are a ton of ways to stay connected with the Feasty Boys. Be sure to check out our fan page on Facebook or watch the latest videos on YouTube. Or for fantastic photos of our Feasty Boys in action, head to our Flickr gallery. To find out how to book the the Feasty Boys for your next event, just Drop us a line. 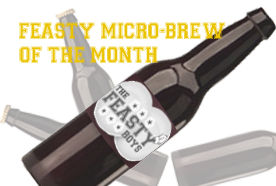 Sign up for the Feasty Boys Newsletter!